Ever wondered who would take care of your outside pets if you need to go out of town? Well, if you’re like the pet owners we’ve met, you’ve wondered the same thing. Most people call their family or friends to help out, but if you’re not completely postive they would provide dependable care, then you should check out our web site sit-stay-play In-home pet sitting & more. LLC. See the kitties above? We provided care for them over the summer. 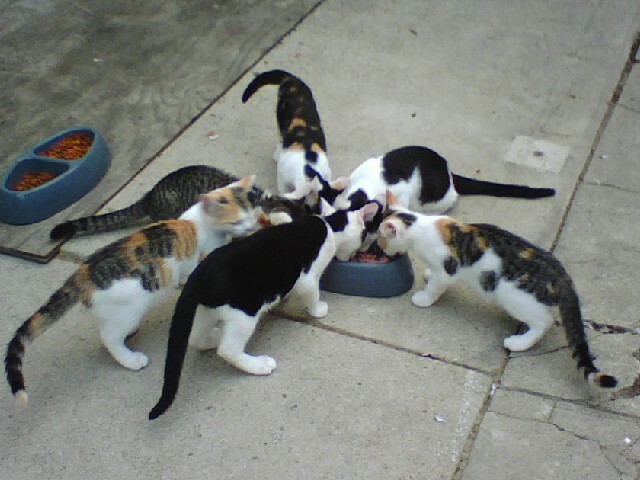 Some people might thing that’s a pretty simple task, but in the busy world we live in today, stopping by to ‘feed some cats’ could get moved to the bottom of the list–or worse–not done at all. That’s where we come in. We’re professionals and take our job seriously. Emergency services–clients can depend on us in case of last-minute emergencies & they need to leave town unexpectedly. So…if you’re looking to try something new with your pets, please give us a call 765-744-5688 or send us a message. Our service area includes Muncie, Anderson, Yorktown, Daleville, Gaston, Hartford City, Pendleton, Mooreland and most areas in between. Look forward to hearing from you.